The Authlogics Password Policy Agent (PPA) is designed for IT managers and CISOs who require protection from identity attacks, and what simplicity for users while reducing helpdesk costs. PPA is a non-intrusive solution that ensures all users have a secure password which complies with the latest NIST SP 800-63B password policy standard. Unlike traditional MFA vendors who, despite relying on passwords within their solution, don’t provide any password security or management, our solution removes the password complexity burden from users while ensuring the password they have chosen has not already been compromised. PPA analyses password changes in real-time and uses a combination of granular policy controls, a rules engine, a custom blacklist, heuristic scanning and is powered by the Authlogics Password Breach Database of over 520 million previously compromised passwords to keep your Active Directory safe and compliant. Are you in our Password Breach Database? Password Policy Agent also works with Windows Desktop Logon Agent to support passwordless logons, while maintaining a safe randomised AD password. How do breached passwords affect security? Critically, the new guidance emphasizes that any new passwords should not appear in any previous password breach. This ensures that the new password chosen cannot be determined from any compromised data used by increasingly sophisticated criminals and hackers. 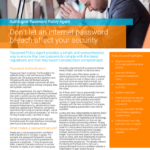 Password Policy Agent uses the Authlogics Password Breach Database which contains over 500 million previously compromised passwords to ensure this isn’t the case. The Basic Edition of Password Policy Agent is available for free, however, it does not include a Product Support SLA, Real-time Password Breach Database protection, Heuristics password processing or a Custom password blacklist. Password Policy Agent is offered as a stand-alone licence or as part of the Authlogics Authentication Suite. Download the installer and evaluate a fully functional copy of Password Policy Agent. Trial, Basic and Full product versions are supported by the installer. Have a question about Password Policy Agent, password security or compliance?